Don't know your prahok from your lort cha? 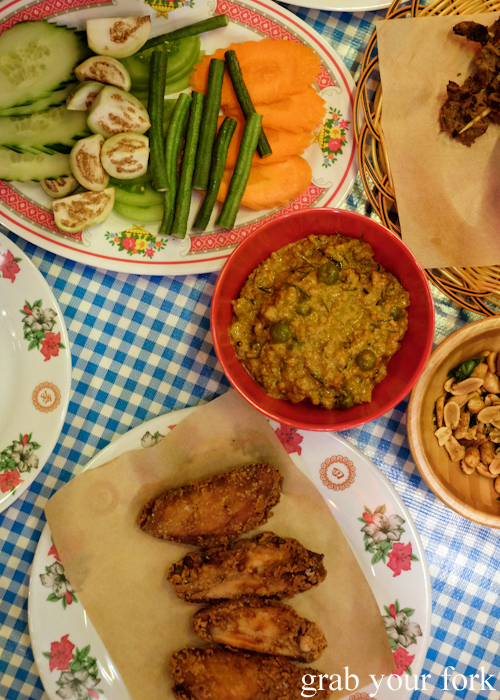 Kingdom of Rice could change all that, the new Cambodian pop-up taking up residence where Pinbone's Dirty Italian Disco once was, in the converted drive-through liquor shop at the Tennyson Hotel. It's a new Merivale adventure for ACME co-founders Mitch Orr and Cam Fairbairn, adding Sophia Thach on the floor (drawing on her Khmer heritage and recent two-year stint in Cambodia for menu inspiration) and Lillia McCabe (ex-Blackwattle, the Singapore sister restaurant to Automata) as head chef in the kitchen. The dining space has undergone a modest but distinct makeover. You'll enter through a new door cut out of the roller door for a start. Gone are the tattoo etchings on the wall. 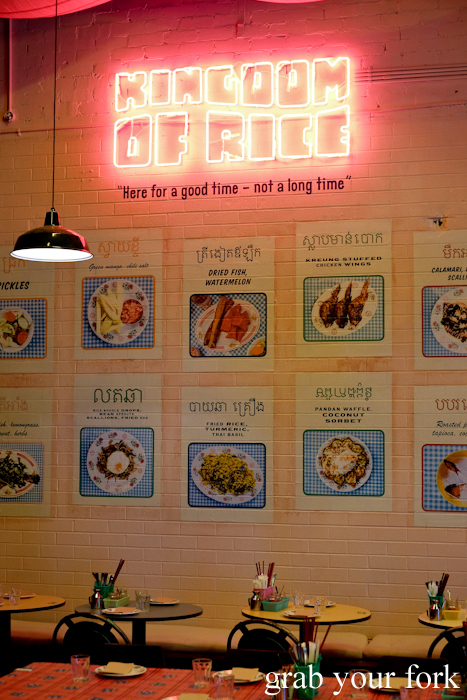 Now it's a deliciously cheesy neon sign with menu photos on the wall. The seating hasn't changed too much, although they've extended the middle table into one continuous communal one. You'll also find plastic baskets holding cutlery, wet wipes and condiments. Load up on kampot black pepper, fermented chilli and tuk trey, the Cambodian fish sauce dressing equivalent to Vietnamese nuoc cham. The little silver pouring vessel holds soy sauce. 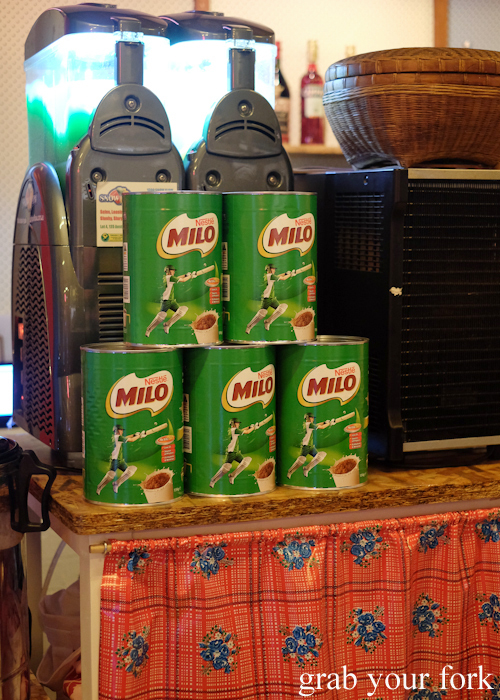 The army of Milo tins are a sentimental touch but you can't order anything Milo-related yet. Mitch confirmed he's working on a Milo soft serve that'll be available as soon as the soft serve machine works out its kinks. 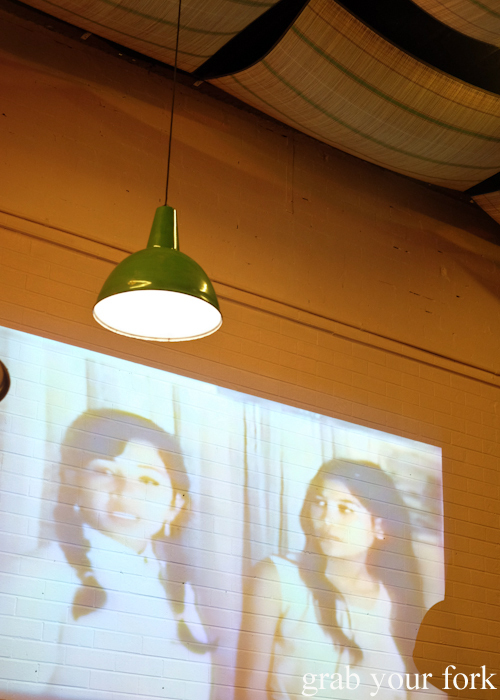 And the data projector used previously for music video clips is now being used to show long lost Cambodian films rescued and restored by an artist friend of Sophia's, Cam explains. Under the Khmer Rouge regime, much of Cambodia's art was deliberately destroyed. It's a poignant reminder of Cambodia's history, framed by billowing bamboo mats hanging from the ceiling. The open kitchen is much the same, although they've removed the wood-fired oven and added two wok stations. The charcoal grill remains plus they now have a sugarcane juicer. 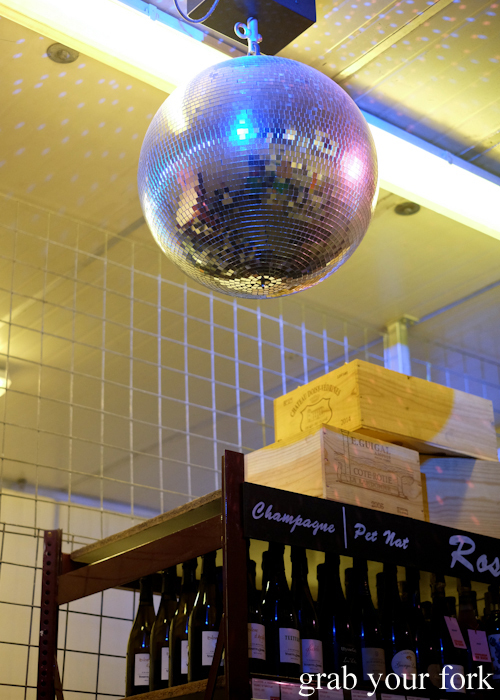 And you can still enter the walk-in cool room - with disco ball - to choose your own beer and wine. 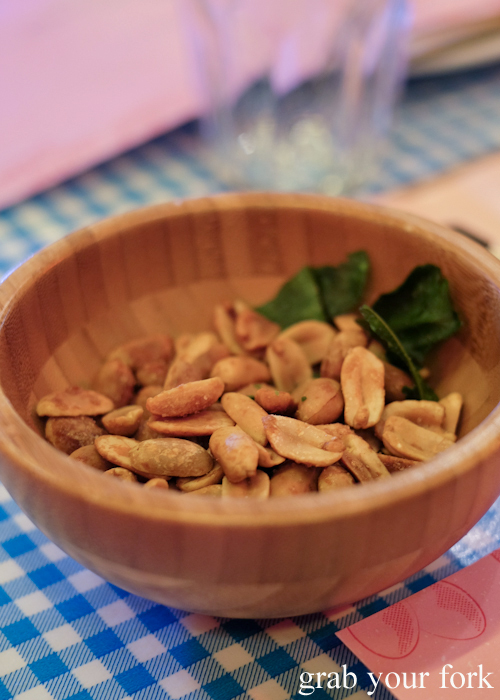 There's a lovely nod to typical Asian aunty hospitality as all guests are welcomed with free peanuts and cold jasmine tea. 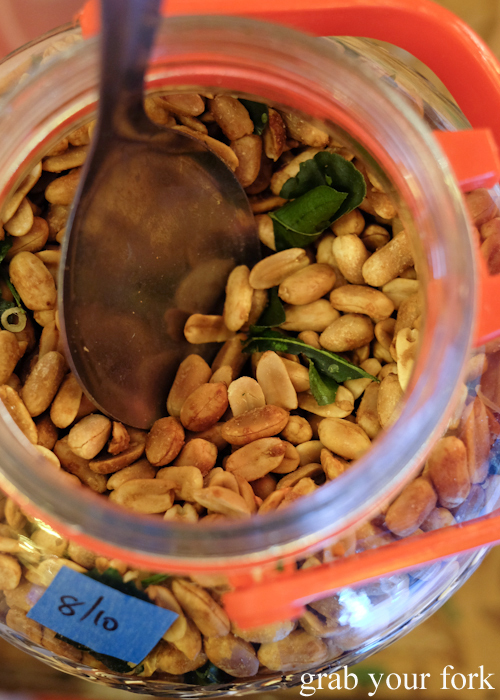 The peanuts are crazy delicious, fried with sugar, salt, chilli and kaffir lime leaves. 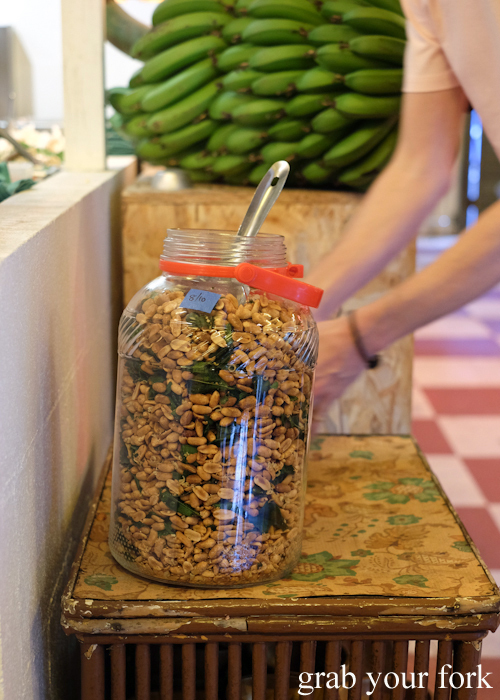 I could've eaten several bowlfuls of these. Cocktails include a pandan pina colada that makes use of a slushy machine (and a noticeable whack of pandan essence) and Hennessy with carbonated jasmine tea (gonna try that with my Sodastream!). 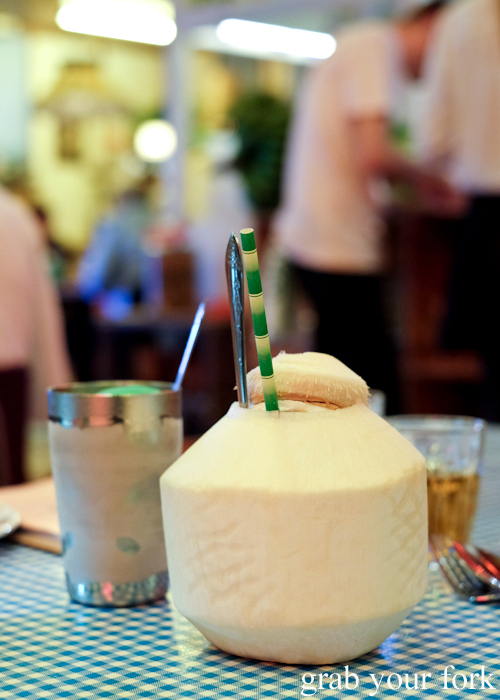 Add Havana Club 3 rum to a fresh coconut for $15 or get one au naturel for $6. 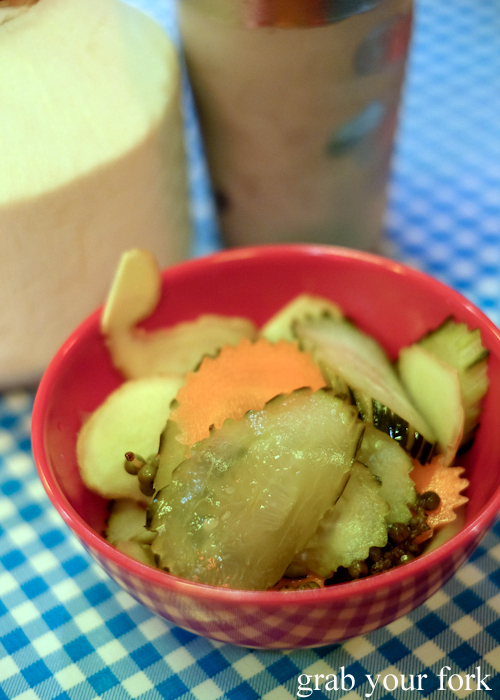 We kick off with chlouh pickles, a sweet and sour combo of sliced cucumber, carrot, ginger and peppercorns dispensed from giant plastic jars sitting in the kitchen. 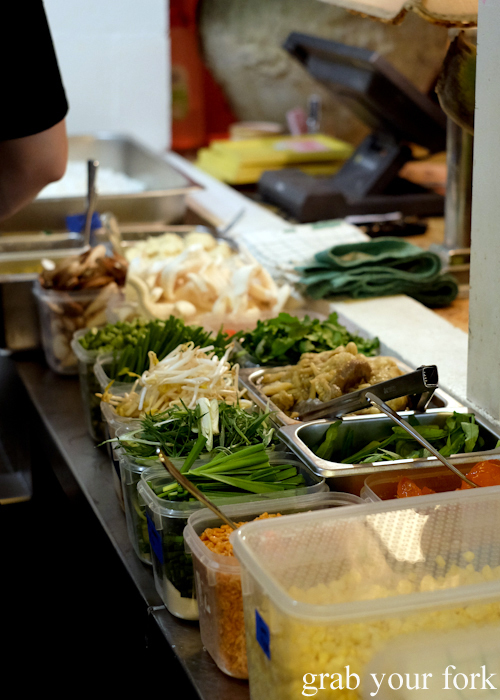 Our dishes arrive thick and fast from the kitchen, although we appreciate them being clustered into staggered courses. 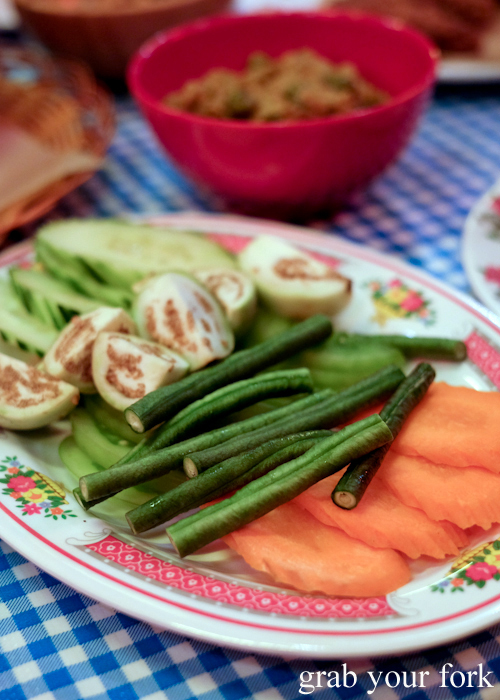 Crudites with prahok k'tis are a tasty way to eat your vegetables. 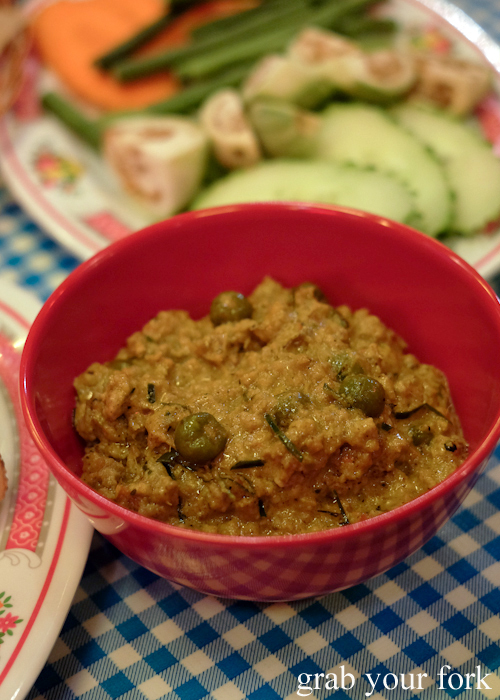 Prahok k'tis is a kind of chunky dip made with pork belly, coconut milk, pea eggplant, kaffir lime leaves, lemongrass and more. 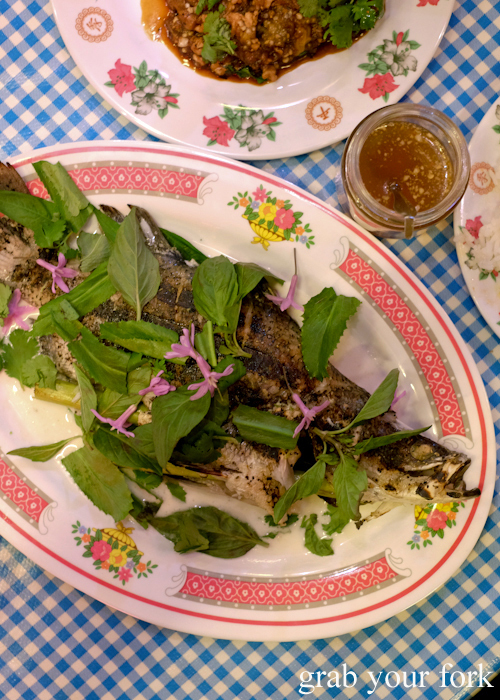 Prahok is the key ingredient, a fermented salted fish that's said to be the aromatic equivalent of blue cheese. 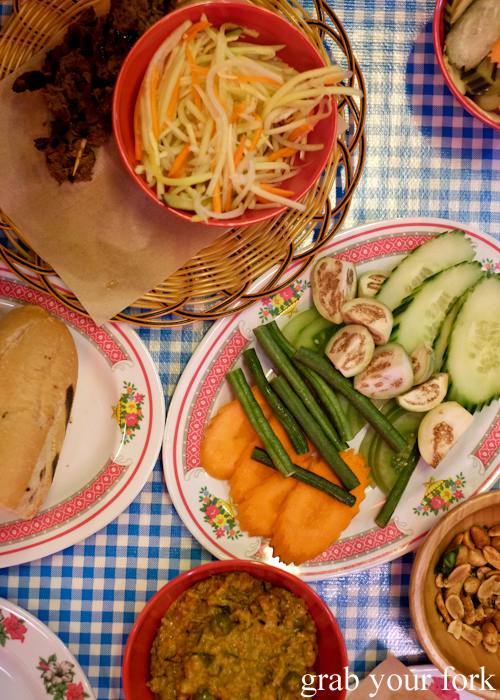 The crunchy mildness of raw carrot, snake beans, green tomato, cucumber and Thai eggplant is an ideal foil for the prahok k'tis, although the intensity of the prahok does feel a little dialled down in this version. 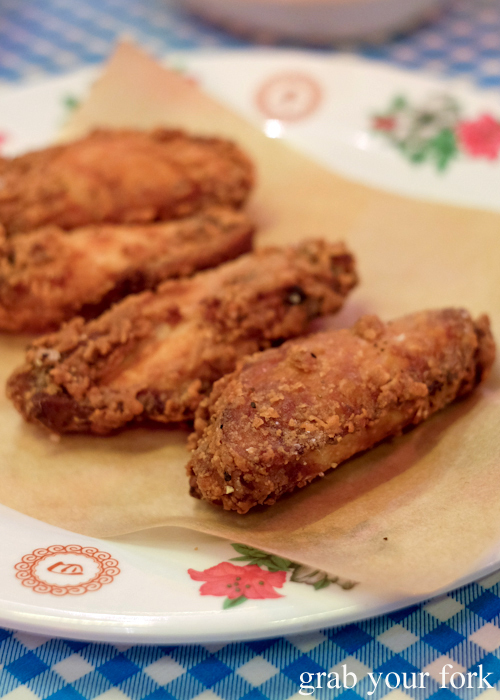 The menu is still being tweaked to maximise kitchen efficiency, Mitch says, which would explain why the heavily promoted stuffed chicken wings are no longer. Instead they've switched to plain chicken wings, albeit marinated and fried to high levels of finger-licking satisfaction. Drench these in the tuk trey fish sauce dressing for even more deliciousness. 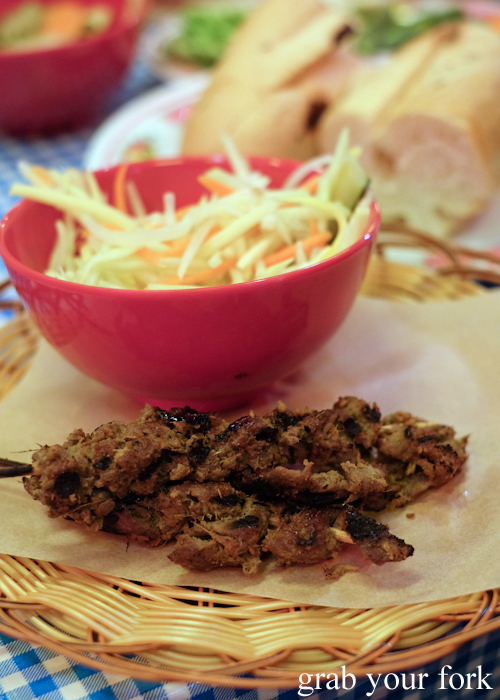 Charcoal grilled skewers arrive with pickled green papaya salad and toasted baguette halves as a sort of DIY take on the Vietnamese banh mi. 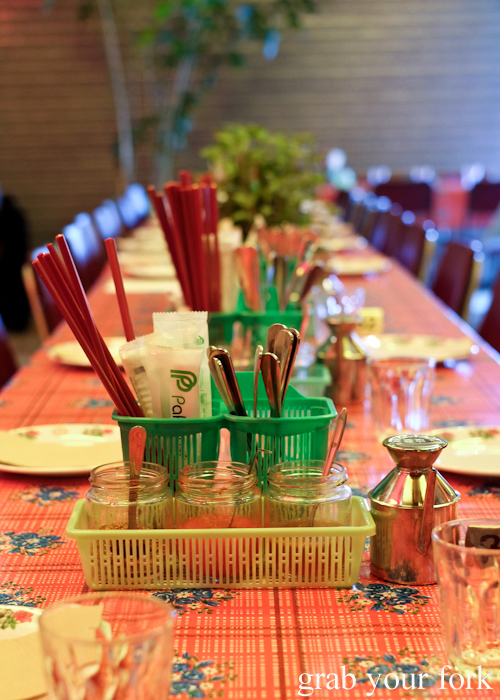 We choose lemongrass beef over caramelised pork or shiitake mushrooms. It's a tasty little number although at $15, it's more of a dish for hands-on novelty than anything else. 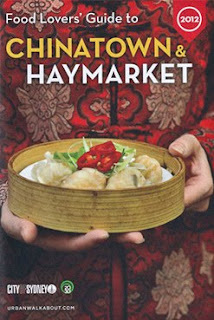 And yes, the bread rolls come from Hong Ha, down the road. 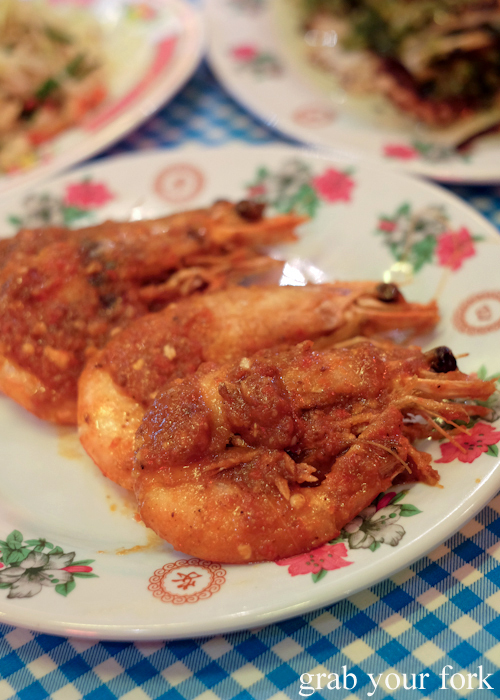 Whole prawns don't skimp on the chilli, fried in a saucy spicy mix of tamarind, garlic and chilli. 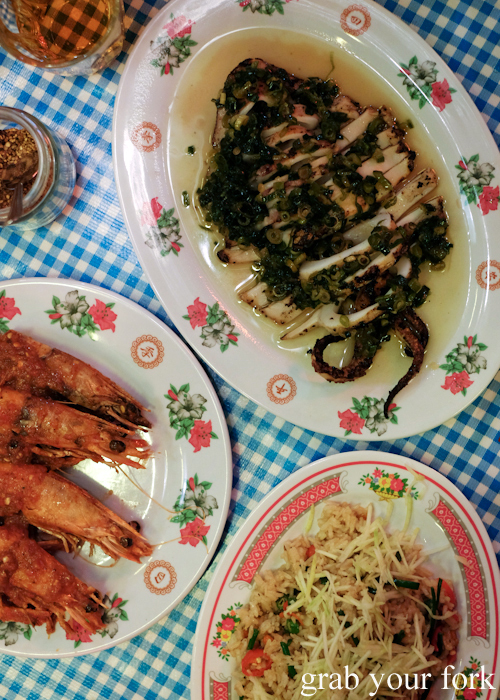 We score four prawns for $26. 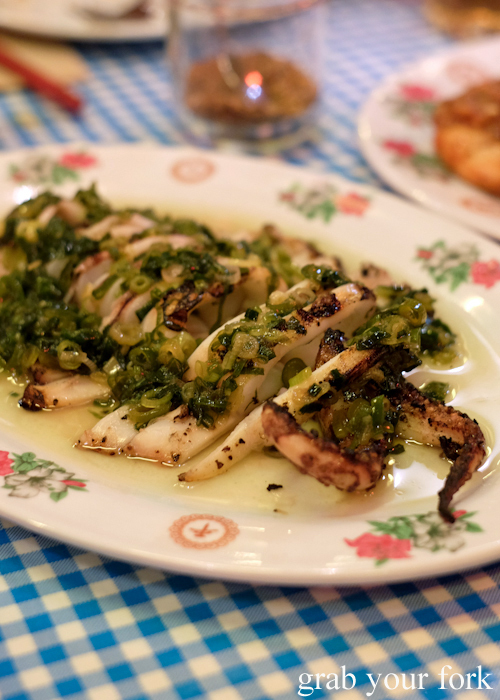 If there's one dish you have to order, it's the mark ung, a whole calamari grilled and drenched in pork fat and fried scallions. It's not the remarkable tenderness of the calamari that gets you. Nor the blissfully charred edges. 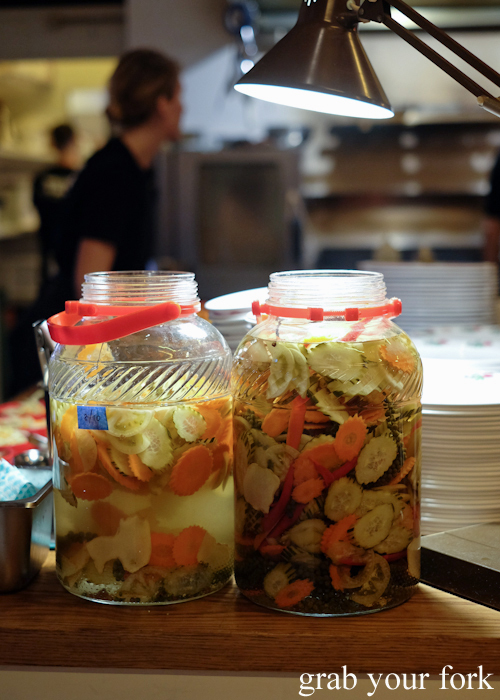 It's all about the sweet sweet pork fat, so deliriously good you could almost drink it. Don't let any of that preciousness go to waste. I spooned it over a scoop of plain white rice and swooned at first bite. 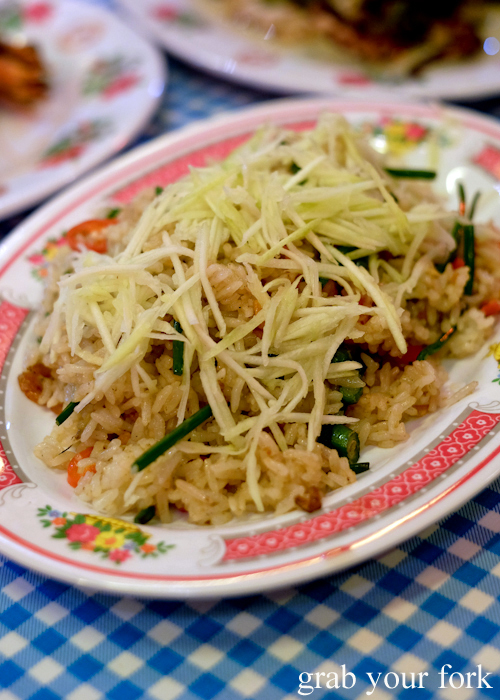 Bai cha kapi fried rice is a fun ensemble, tumbling charred rice with snake beans, dried shrimp and chilli. A blanket of shredded green mango across the top adds both a sour and sweet touch. 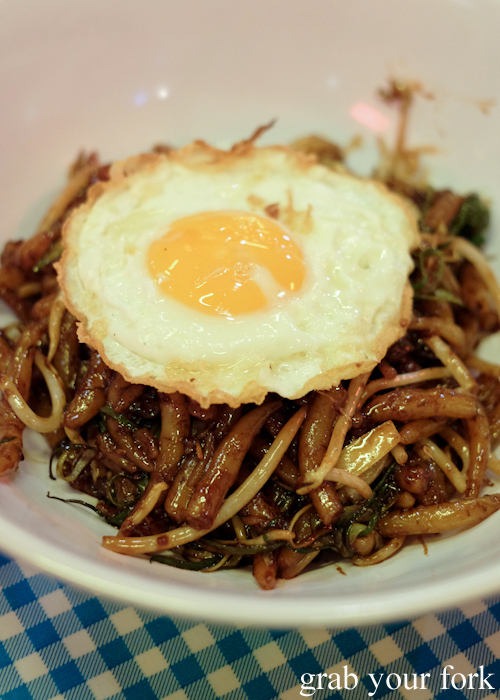 Lort cha is one of Cambodia's most popular street foods, a stir fry of rice drop noodles with bean sprouts, sliced beef and a fried egg on top. They've omitted the beef here but it's still tasty. 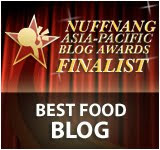 It reminds me of Malaysian char kway teow, although a little sweeter. The rice drop noodles have just the right amount of chew. 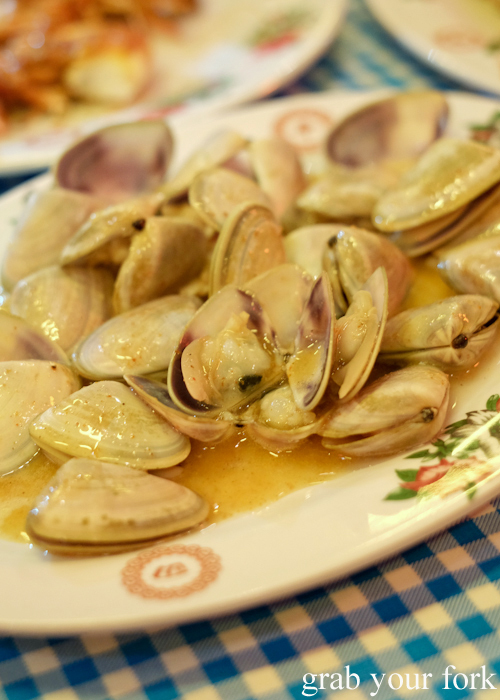 If you're looking for zing, get the pippies, cooked up in sauce that's heavy on the lime and kampot pepper. The pippies are plump and juicy, and your tastebuds will water as soon they're hit with that citric punch. 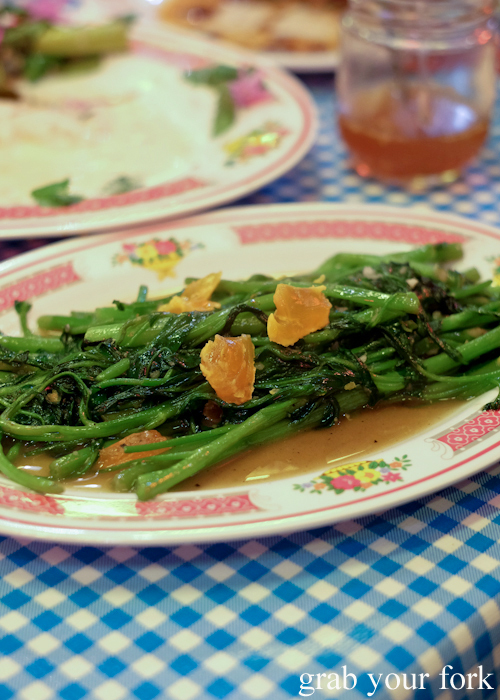 Our vegetable quota is fulfilled with the water spinach cooked in oyster sauce with salted yolk. 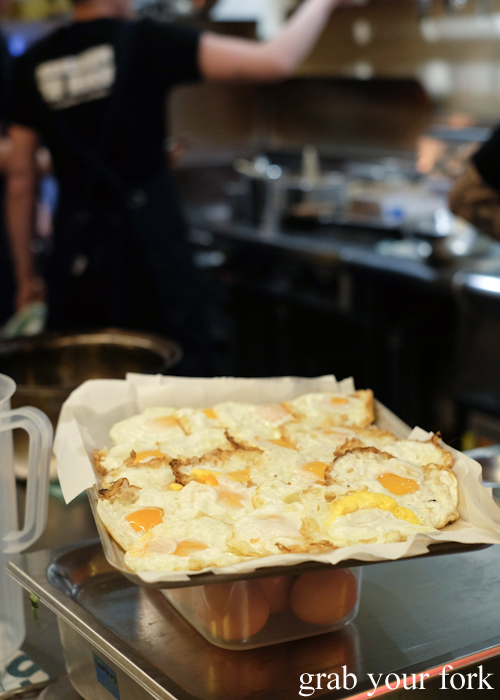 We'd expected the yolk to be more crumbly, but it's almost jelly-like in consistency. The water spinach itself is super soft and tender. 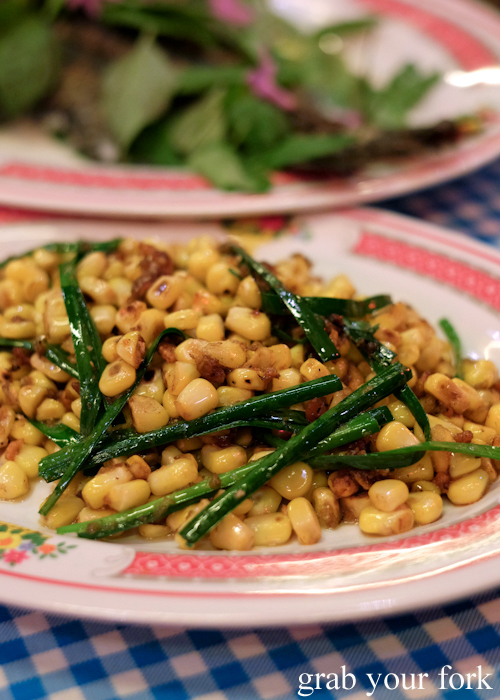 The bort ling corn with dried shrimps and garlic chives will mess with your mind, in a good way. There's a bewildering juxtaposition between the sweet kernels of corn and the salty dried shrimp. Add the gentle heat of garlic chives and you have one big flavour party. 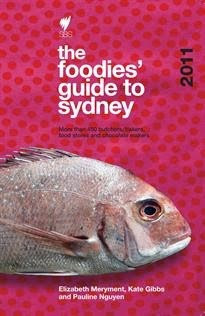 We also demolish the whole fish - tonight it's barramundi - cooked with coconut milk, lemongrass and herbs. The fish is terrific, not particularly muddy as it's prone to be, and cooked to fork-flaking perfection. The sprinkle of herbs and petite garlic chive flowers across the top adds an elegant prettiness. 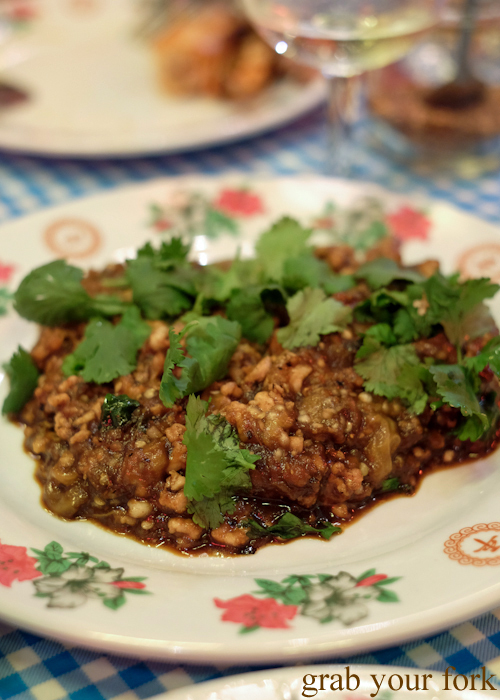 But the second dish you must order (after the calamari) is the chicken with smoked eggplant and coriander, another popular Cambodian dish (although pork mince is usually the protein of choice). Why have we never seen this dish before? It's phenomenal. Imagine soft nubbins of chicken mince canoodling with fat hunks of sticky smoky eggplant, the kind you imagine could easily be turned into a kickass baba ghanouj. If you love smoky food, you will adore this dish. And possibly want to marry it. There are just three desserts on the menu right now. We order all three. 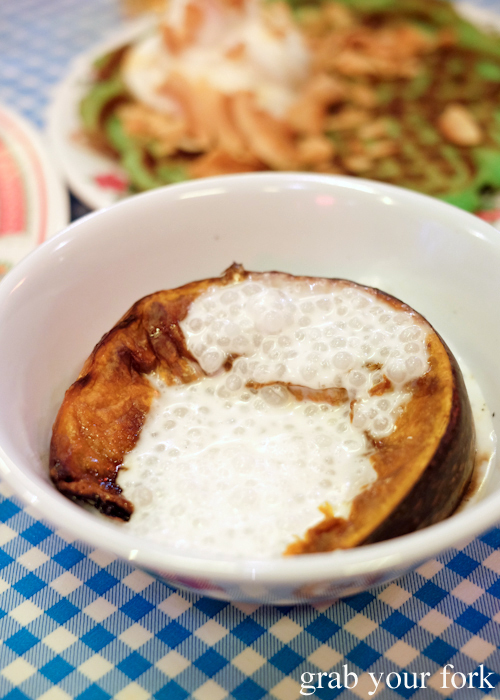 The bobor lapoav is a more rustic version of the borbo skor la pov, a sago and coconut milk soup with either pumpkin pieces or pumpkin puree. Here the ratios are switched so you score a wedge of roasted pumpkin (skin on) with a ladle of tapioca pearls cooked in coconut milk. It's not quite as sweet as you'd expect, and feels a little short on liquid, but it's definitely a dessert you could imagine your Asian aunties getting behind, based on healthiness and low sugar content. 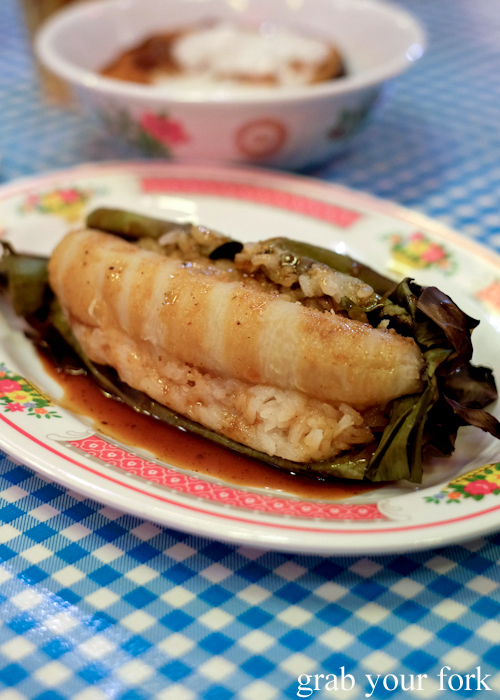 Hitting the savoury side too, is the jek ung grilled banana with sticky rice. The banana itself is more starchy than sweet, and there's only a skerrick of star anise caramel. If you're looking for a filling dessert though, this would be it. 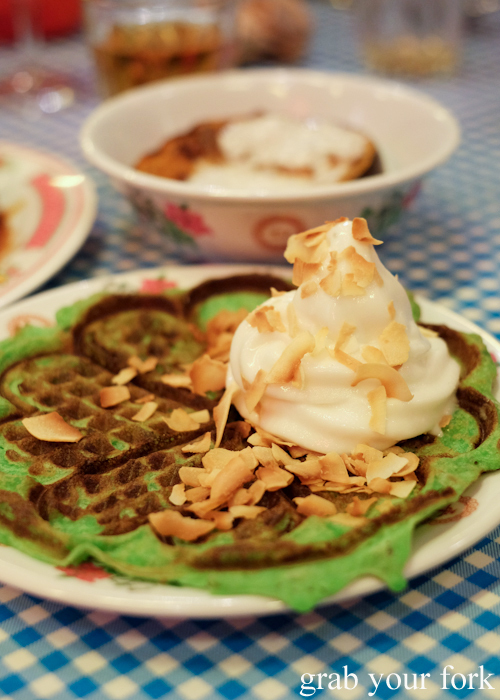 Which is probably why we all pounce on the pandan waffle with coconut sorbet. The waffle itself feels a little deflated, as though the batter was too thin at the start, but we dig the coconut sorbet and toasted coconut chips. Because. SUGAR. Damage for 5 females with assorted drinks (including two bottles of wine) came to $88 per head. 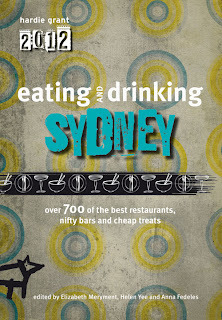 And in a space that continues to bring in the punters, it clearly demonstrates that a) Merivale knows what works and how to work it and b) Sydneysiders will happily prioritise good food over fancy decor, and will eat outside Surry Hills and Chippendale to prove it. I'll head over for your choice dishes Helen, the phenomenal ones. 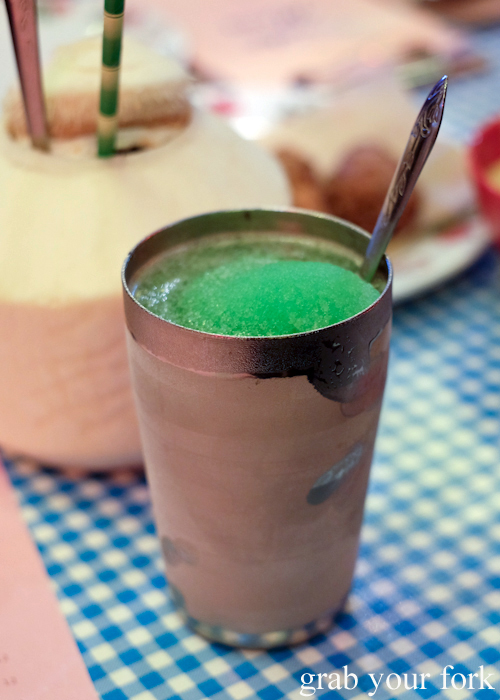 And the Pandan Pina Colada!